Jurgen Klopp reflected on a wild afternoon as Liverpool scraped through with a 4-3 victory over Crystal Palace to go seven points clear in the Premier League. A fierce atmosphere at Anfield played host a dramatic 95 minutes of football, as two familiar foes faced off in a clash that tested the Reds’ title credentials. Andros Townsend opened the scoring for Palace, then Mohamed Salah and Roberto Firmino struck after an icy half-time, only for James Tomkins to restore parity with a far-post header. Salah then regained the lead, but James Milner‘s red card led to a difficult end, as despite Sadio Mane scoring a fourth the hosts were forced to hold on, with Max Meyer’s consolation prompting a late scramble. Fortunately, Liverpool were able to secure the victory, and speaking after the game Klopp praised their efforts. “We were dominant in the first half but we were 1-0 down. “Zaha had a really good game, he gave us a lot of things to stop. You cannot defend him alone. “Nobody should be surprised by the character of the boys. Outstanding. Work rate, unbelievable. 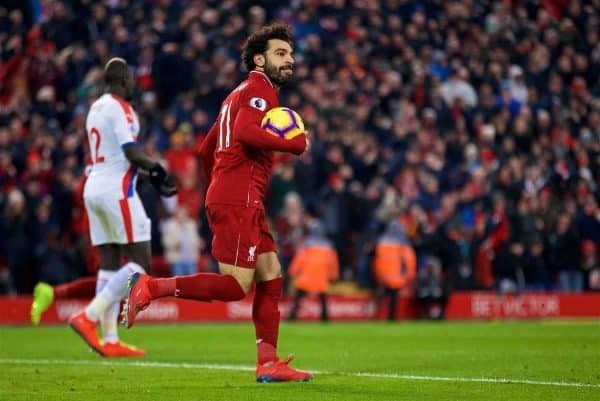 A gritty clash was provided its flourish by Salah’s brilliant double, with the Egyptian King reaching the 50-goal landmark in the Premier League—with 48 of those coming in 59 games for Liverpool. Klopp described Salah as a “world-class player,” and joked that he would perhaps have come closer to the likes of Andy Cole, Ruud van Nistelrooy and Alan Shearer if he had moved him to a central role sooner. Winning on Saturday was crucial, as the Reds can now enjoy a lengthy break before the arrival of Leicester City on January 30, during which they will head to Dubai. “Two days recovery, then we start preparation for the Leicester game,” Klopp explained of the upcoming warm-weather training camp.